If you look at this plate of food and say, “What the …?” then I guess today’s mission is accomplished. Earlier this year, my fifth grader read Little House in the Big Woods by Laura Ingalls Wilder. Every book in that series was a favorite of mine at her age, so I was happy to watch her enjoy the book and learn about American life in a different time. I was equally curious as a girl, and my mom was a willing teacher. She showed me how to make candy syrup, boil it to the hard-crack stage, and pour it over snow to cool it quickly. I remember the results tasted just so-so. But the experiment was exciting, and I felt a distinct kinship with Laura Ingalls Wilder. So today I passed down the tradition. Hannah found a website that provided easy directions, and we gave it a go. From the mom side of the experience, I would say the experience was a bit stressful (a pot of boiling syrup is dangerous, especially with little noses poking over the edge, studying the molten sugar), and the resulting sweets were okay at best. 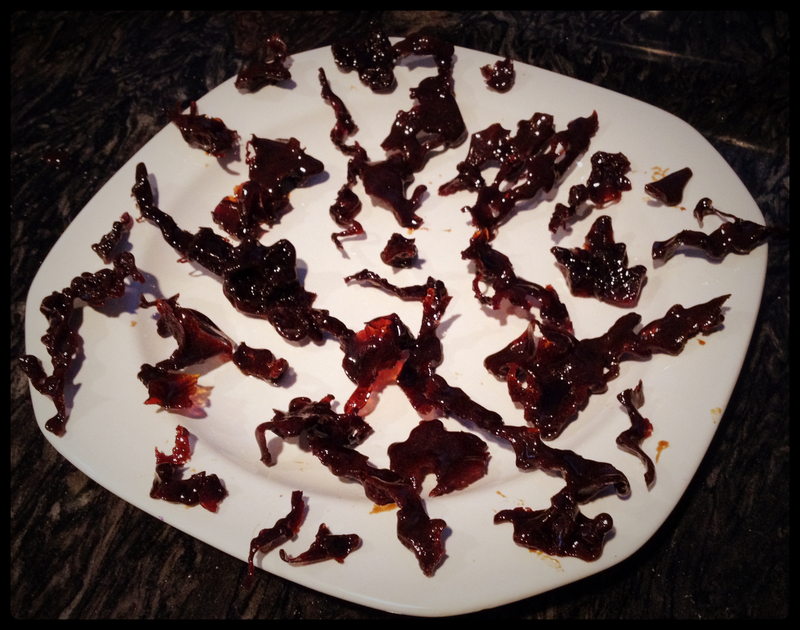 Both daughters, on the other hand, loved not just the adventure but also the outcome: a plateful of mangled, sticky, nearly burnt, molasses-flavored candy. It may not look particularly appetizing, but it is edible. They would tell you it’s delicious. We cooled our candy on trays full of crushed ice, because in the middle of the afternoon today we had just a dusting of snow on the ground. Now, several hours later, the flakes are still falling, and the white stuff is accumulating. Something tells me the girls will want to make another batch of candy tomorrow—using real snow.